” President Donald Trump’s Week 10 in Office – Mar 27-31, 2017 – Need for Redemptive Restoration and Renewal ” – March 31, 2017. 1. Pulling down the Affordable Health Care Act (AHCA) and the frictions between the groups within the Republicans coming to the surface could well impact his other ideas/programs like tax code etc. 2. John Kasich, Ohio Governor, said that bipartisan engagement (including views of Democrats) is essential for the AHCA to attain fruition. 3. Medicaid now covers more Americans than Medicare and it played a significant role in stopping the Republican initiative to repeal and replace the ACA. House Republican leaders say they have restarted negotiations on repeal of ACA. 4. Congress passes bill allowing ISPs to sell customers’ web surfing data. ISP privacy rules remain eliminated, – the rules issued by FCC would have required home internet and mobile broadband providers to get consumers’ opt-in consent before selling or sharing web browsing history; app usage history; and other private information with advertisers and companies. CRA passed a joint resolution that FCC cannot issue similar regulations in future. 5. Jared Kushner, son-in-law of President Donald Trump, to be questioned by the Senate Intelligence Committee about the meetings he arranged with the Russian Ambassador, Sergey L Kislyak. 6. Carl Icahn, the billionnaire, is advising on regulations including pressing for a change in an EPA rule that has cost an oil refinery he’s interested in millions of dollars. 7. Investigations into Russian-US election meddling by Senate and House enters a critical phase. 8. President Donald Trump’s eighth consecutive weekend spent at properties bearing his name. Questions arise whether his relaxation schedules are justified or not. 9. Trey Gowdy to head FBI as of April 1. By virtue of holding a Congressional job he’ll officially be the FBI Director in January 2019 only. Until then he’ll investigate cases including Benghazi. 10. North Carolina General Assembly voted in favor of a bill that’ll repeal the controversial law affecting transgender bathroom use in public buildings. When the Governor signs it, this will become a law even while this is not favored by groups on either side. 11. President Donald Trump sees the Freedom Caucus, opposing his agenda causing a great setback to his new AHCA last week, as a threat that needs to be countered seriously. 12. In a move intended to rewrite Clean Power Plan and secure Energy Independence even while rolling back former President Barack Obama’s “Climate Change” legacy, President Donald Trump signed an Executive Order that’ll free the US from previous Climate Change commitments. The expectations of bringing back or giving a push to mining jobs, however, are not seen as encouraging at this juncture. This act will give China an excellent opportunity to assume a new role as the torch bearer of Climate Change initiatives and Control efforts in future. 13. President Donald Trump’s daughter, Ivanka Trump, will become a government employee in the capacity of an unpaid adviser to the President in the White House. This is expected to neutralise the criticism from ethics experts, it is felt. 14. Michael Flynn, former NSA, has expressed his interest to respond to the House and Senate Investigators examining Trump Campaign’s ties to Russia in exchange for immunity from prosecution. The investigators, however, at this moment are unwilling. 15. The surge of optimism among Democrats from actions in the last couple of months is likely to invigorate them for the 2018 mid term elections. 16. 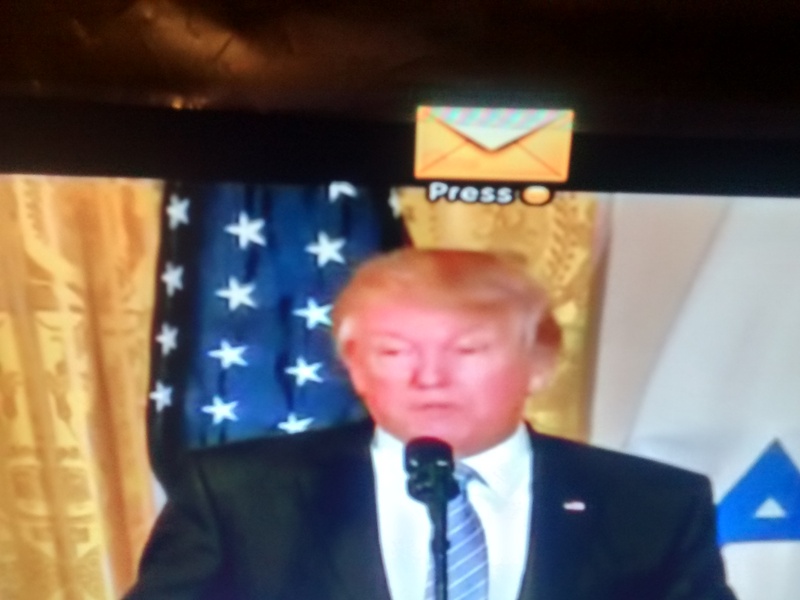 President Donald Trump signed two Executive Orders – one aimed at identifying and targeting foreign trade abuses, a 90 day study of US trade deficits with some largest trade partners; and two, a measure concerned with effecting enforcement of US anti dumping laws. President Donald Trump may well resort to the following actions in an effort to redefine his strategy to fulfil the promises made. The figure below represents the ‘Redemptive Restoration and Renewal Act’ of President Donald Trump to right the wrong. 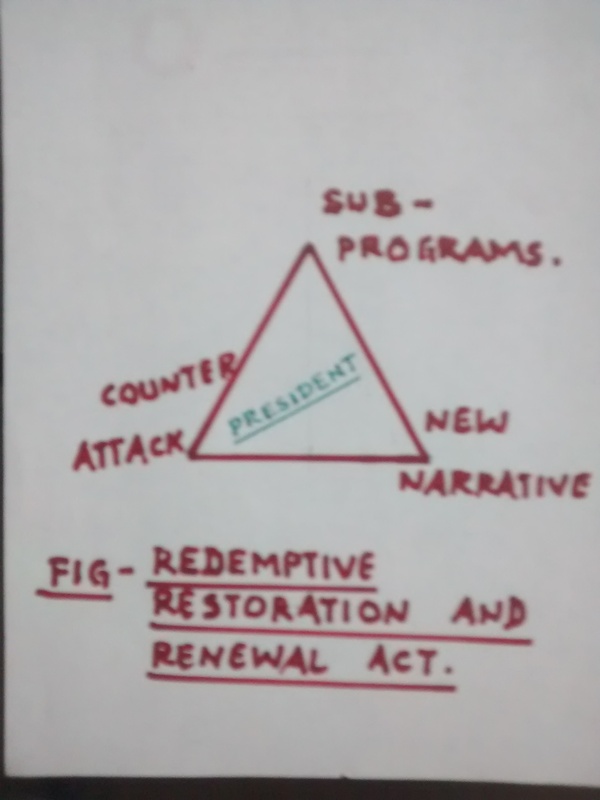 (a) Identify sub programs to every major program prior to execution : The celerity with which President Donald Trump’s actions appears in news is faster than even the flying rumors in this new age. Whether this can ensure the expectations of people and constitute a sustainable new political model is what perplexes and worries analysts, media, and the common people. For e.g. if bringing more jobs is the core idea, a practical accompaniment to improve the necessary modern skills of jobs is the best way to empower people. It means that every new program launch should incorporate a “sub program” to leverage modern practices and actions for better outcome. The financial outlay may involve federal, state, or private (concerned industry sector) contributions as necessary. It is like breaking a complex problem into simple elements to solving the whole issue. (b) A new narrative and its propagation : This involves designing a new form of a narrative in the manner of storytelling and propagation of the same to the larger public through all available channels of communication intensely. Every aligned legislator should devote fully to this task in his/her constituency to bring about a change in the minds of people. With the withdrawl of AHCA last week, President Donald Trump is burdened with the problem again. It is an example of a leader with power acting faster than others before, but not heeding to the big requirements that’ll make people who matter in passing legislation satisfied. It also serves as an example of an issue/program howsoever noble it is can meet with failure in this age of restless antagonism. While the support of Democrats cannot be taken for granted, the possible Republican revolt is of serious concern. Success of passing the bill has now been blocked. President needs to make the people feel that it will be better for them to seize the opportunity to make progress. He also needs to get from them (they have a moral responsibility to give strength) the elements that can make the passage of law well and safe. This is what every legislator supporting the program shall strive to ensure through active propaganda in his/her constituency. This is what public support is all about. I know it is simple to say but hard to implement. But it ought to be done. (c) Counterattack : This is the ‘obvious’, in the form of an Aggressive Counterattack, bringing about the fallacies of the years long failed program(s). President Donald Trump, despite setbacks, is moving at a brisk pace in all his initiatives : Strong military action in Yemen, Syria, and Iraq; Strong statements to the effect that the AHCA will witness its renewal; Eliminating the ISP privacy rules even if it cannot be viewed as flawless fully; Getting ahead with construction of the border wall with little regard to financial feasibility; Being firm on travel ban issue; – these are just a few to cite in this regard. It is not my argument to justify the actions but to emphasize the tenacity and intent of actions that at times may yield positive results. Can offence be the best form of defence ? ‘No’ as well as ‘I am not sure’. We’ll have to wait to see. In conclusion : Overall, it appears that if the President does not want the trajectory of his actions to be impeded with such failures (withdrawl of AHCA ) any further, the three aspects depicted in the figure earlier may well be one of many recipies. Tidbit : ” No man will ever bring out of the Presidency the reputation that carries him into it ” – Thomas Jefferson.